It's freebie time! I know I've said it before, but I just love doing stuff like this and I could spend all day every day making printable goodies like this. I'm such a dork. This time I'm sharing a full page of a pattern I call "Flourish" along with a page of coordinating gift tags. Flourish is a colorful floral pattern of peonies and anemones with a soft spring color palette. I think this little batch of goodies could come in very handy for a certain holiday coming up next month. Ahem. Mother's Day. The full page pattern could be used as scrapbook paper, gift wrap, to make (as I did) a gift envelope, or maybe folded into a small paper box if you like projects like that. I printed the gift wrap page on standard printer paper on a high quality setting and although the colors won't come out quite as bright on regular paper, it still made nice gift wrap. Obviously you're not going to be printing your own gift wrap in mass quantities (even I won't go that far), but it's a good size for a small gift box or (ahem) jewelry box. You know, for your mother. Then I decided to print the pattern on a more sturdy piece of Epson Premium Presentation Paper Matte (you could also use card stock) and make an envelope out of it. Of course I could have come up with my own envelope pattern but come on, that's what the internet is for. Why reinvent the wheel? I found this envelope template on Riva la Diva. Do a quick google search and you'll find all the envelope templates you'll ever need. I like that this one makes a more "gift" envelope as opposed to a standard letter envelope but you could do that too. I traced the template on the back of my paper, cut it out, and folded it along the fold lines. Hint: if you've never done this before, score the fold lines first by running an Exacto knife or the tip of your scissors along the line very gently so you don't go through the paper - it makes the paper fold easily and you'll get a nice crisp line - it's worth the extra time. 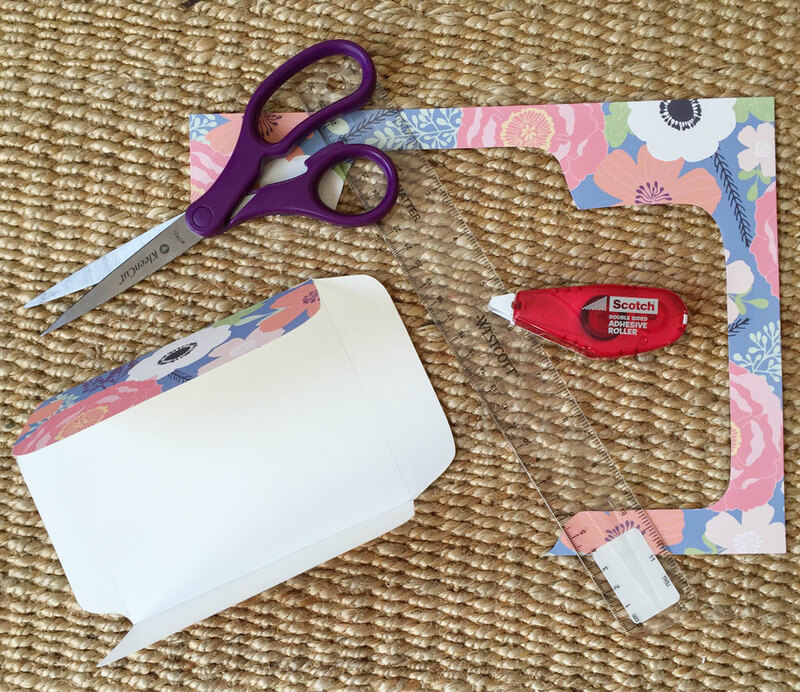 You can use a bone folder or the edge of a ruler to flatten and smooth out the edge. I used this handy adhesive roller to seal the flaps, which might be my new favorite gadget. Then you could use a sticker or wash tape to close the envelope, wrap it in ribbon, whatever. I think it'd be a great way to give a gift card or gift certificate. You know, for your mother. Use all those gift tags to add the matching finishing touch. I hope you enjoy the printables! I had a great time making them because I'm weird like that. If you want more printable fun check out my Freebies page. ** Printing Notes ** * For best quality, print on good paper and print on a high setting. Print actual or full size on standard letter size (8.5x11 in.) paper. When printing the full page pattern select the "borderless" option if your printer has one and the pattern will print all the way to edge of the paper, otherwise you'll get a narrow white border you can trim off. * This particular printable is a two page PDF file so you might want to print each page separately. * As always, for personal use only. Please don't sell, copy, or distribute in a questionable manner - you wouldn't do that to someone's mother, would you? Here's a behind the scenes pic of this project with all my crafty shrapnel all over the floor. It was nice and sunny there and the perfect way to spend a Friday morning. Celebrating Autumn with new downloads! Yesterday was the first full day of fall and fall has always been my favorite season. In my part of the world fall is a beautiful time of year. Warm days, cool nights, fiery trees, bonfires, pumpkins, the smell of cloves and cinnamon, the sound of leaves crunching under your feet. Mmmm. Today I'm celebrating the arrival of autumn with a couple new goodies. First, I have my first digital download art print: Autumn is a Second Spring, available in my Etsy shop. For $5 you get an instant high quality PDF download of this 8x10 print you can print at home. Put it in a frame, stick it to the wall, give it as a gift, it's up to you. It's kind of fun to switch up your surroundings with a seasonal print. I have a frame in my kitchen that I tend to change out with the seasons. And I love the nature of these digital downloads. You don't have to invest much time or money and you can use them in so many ways. I printed mine at home with my very basic Epson scanner/printer, on Epson Premium Presentation Paper Matte (available at office stores) and it turned out great. It makes such a difference to print things like this on nice paper - the colors come out so vibrant. Even my husband (who has a love hate relationship with our printer) said, "This looks really nice! Our printer did this?" Once I listed the print I decided I wanted to make something to go along with it. So you can download this coordinating digital paper for free! The digital paper is sized to print on a standard letter size (8.5x11 in.) paper. Again, use the nice stuff, and then select the "borderless" option if you can. I can only do it when I've selected these other thicker papers in my printer dialog box. And before today I had NO IDEA MY PRINTER DID THIS! It printed all the way to the edges (like printing with a bleed). If you can't get this part to work, it's fine, it will just print with a small white border around the edges you can trim off. Then it's time to use it however you want! I made a couple examples below: a small menu card and a thank you gift tag. But you could use it for scrapbooking, bookmarks, put it in the bottom of a tray under glass, put it in the back of a shadowbox frame with some other fall decorations, whatever your little creative self can come up with! I'd love to see how you use it, so send me a picture, wouldcha'? I hope you enjoy the print and the coordinating freebie and I hope, wherever you are, you enjoy fall as well. * As always, for personal use only. Please don't sell or distribute in any way. © Katherine Lenius.